We’ve got a whole mess of emails, since we haven’t managed to check them on-air in a few weeks. I mean it, we’ve got a lot! Look at the title of this episode! We are not screwing around here! And since I played the old Beast deck on the last live episode, Mike decided I should do an Out of the Deck Box with it. It’s been a while since I talked about it, so I dug through the deck, told everyone what it does, and realized it really needs some changes. So we kicked around some ideas for updates, most of which I actually executed in the time between recording and uploading. Let me know if you guys have any other suggestions for it, I’m always willing to ignore our listeners! I mean…listen to them. This entry was posted in Podcast and tagged mad libs, out of the deck box. Bookmark the permalink. Follow any comments here with the RSS feed for this post. Post a comment or leave a trackback: Trackback URL. I have no idea how that happened, but thanks for pointing that out! It is now fixed and should be working properly! The contest has me rather excited. D: I’m rarely involved in such things. ;_; Oh, about the playmats.. what are the designs on them? Randy has a Tenth Edition Incinerate playmat I really want to get for the contest on Tuesday. But that’s only 6, with 7 prizes. For the last one, I guess we’ll figure something out. Randy has two non-Magic ones, some kind of dragon thing and some kind of bikini angel chick thing, but I’d rather have Magic-related playmats if at all possible, you know? Oh, I’m sorry man. I didn’t mean to ruin such a great surprise.The prince of Thralls playmat sounds really cool though. Personally having the playmats signed by you guys would indeed be very Less-than-three worthy, keep doing what you do =3 Also Mike in general is not safe for work, When he was talking about Krosan tusker’s Oracle wording, the energy drink I was indulging in went, from the can to my mouth, then via my nose all over my Keyboard. Would that look a little something like this? Double post! The other two that are at Top Deck Games are Female Hunter and Passage Denied. Google that with the word “playmat” and you can see what they look like. OhMyGod have you guys seen the ‘Announcing the name of the first set of the next block’ on the Wizards main site?! Huh, I just noticed the number at the end of the address. Ominous. Anyway, the real reason I’m so excited is that the art featured has Liliana Vess with that Veil-thingy (which is hot) and that means that we might finally get to see Zombie-beast-summoning-Garruk (After two blocks it’s about damn time). When Chewie said that Robert was me with respectability, I looked up from my lunch and said “Hey!” quite loudly, startling an entire table near me. Awesome. Chewie’s beast deck looks fun, but could definitely use some improvements from the new sets. And as for Innistrad, I suspect it’s a new world, since the plane where Gideon and Chandra visited got its “Curse of Darkness” dispelled when the leader got removed. I suspect it’s a different plane, perhaps Lilliana’s home base. Oh? And what improvements might those be, Mr. Smarty Face Man? Holy Crap, I didn’t even realize that was Liliana! What with all her lack-of-facial-tattoos (-slash-scarring-from-black-mana)! Ah, Jaym! The last set Phelddagrif designed was Ravnica, and we all know how that turned out! I really like Beasts. I have tried Garruk’s Packleader in a similar deck and found it WAY too slow and changed to Wirewood Savage who has more than pulled her weight. I would also prefer to run Overwhleming Stampede over Master of Warcraft. Chewie’s gonna be on the Avant-Card Show? I was wondering what it would take for me to listen to their next episode after Debby broke my brain while I was listening to the last one. I guess now I know. Oh cool, where else have you heard it? To be honest, I’d never heard it before, but I wanted to use something by The OneUps, so this happened to be the one I picked. Holy crap, you were our 100th comment! Ha! That’s awesome. But no, sadly I’ve only made it to their Episode 52. Anytime I’m on the road by myself, I tend to have their show ready to go on my iPod though. Aren’t they great? As much as I appreciate the discussion, for the comments on the site, let’s try to stay on-topic please? If you wanna go completely random, go to the forums at http://cardshark.freeforums.org. Sweet. Congratulations to dirk and his lesser spawn. Brian sounded so tired throughout the episode, it really made it feel like Dirk was there in spirit. Hey. 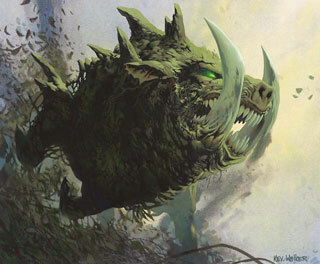 After listening to a few episodes where you spoke about Krosan Tusker, I finally put one in my Teneb EDH, and, so far, it’s one of the most awesome things ever. Thanks again, Mana Pool. glad you guys liked the mad lib! Totem speakers… straight from the command zone!